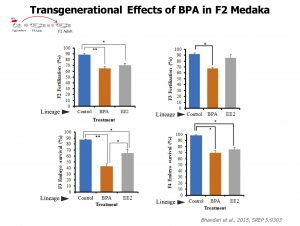 “Nutritional restriction or exposure to hormone mimicking chemicals during early gestation cause alterations in adult and offspring health in humans and model organisms across several generations suggesting that mechanisms associated with transgenerational inheritance of disease states may be conserved”. Picture below shows the toxic effects established by direct exposure may be expressed as adverse health outcome in the exposed individual or may not express at all. Fig. Environmentally induced phenotypes in humans and fish. However, such direct effects remain latent for a couple of generations and may emerge as multiple adverse health outcomes in the individuals at later generations. In humans, it is difficult to ascertain such effects but taking a information, that is conserved among comparative models, into consideration effects on future generations of humans can be predicted. We are developing mouse and fish models to identify conserved mechanisms that are specific to environmental stressors and adverse health phenotypes. Fig. An example of transgenerational phenotype in fish, especially for exposure occurring during early embryonic development.